AI Interactive Series #2: Circlet Tryfold Cards – four ways! 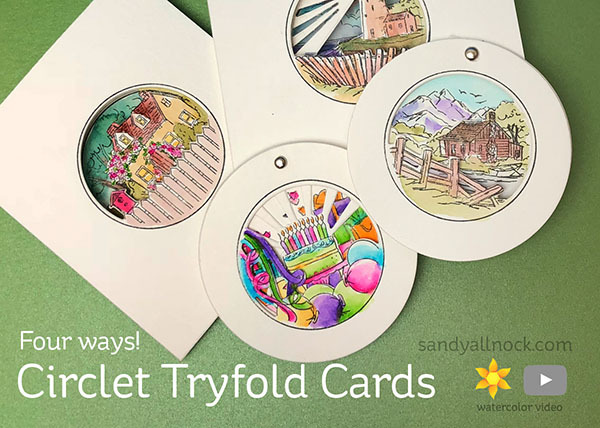 I saw some photos from CHA showing alternate layouts for these cute circlet tryfold cards. Lots were way crazy fancy! 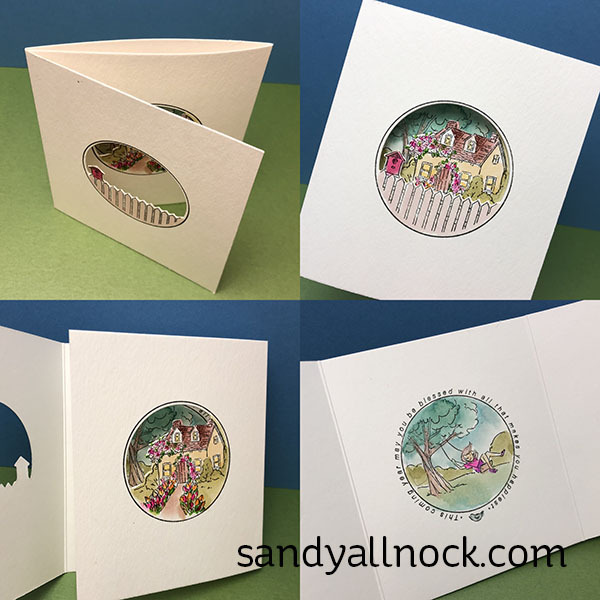 The circle ones had patterned paper layers and more – I do hope someone does videos showing how they made them. 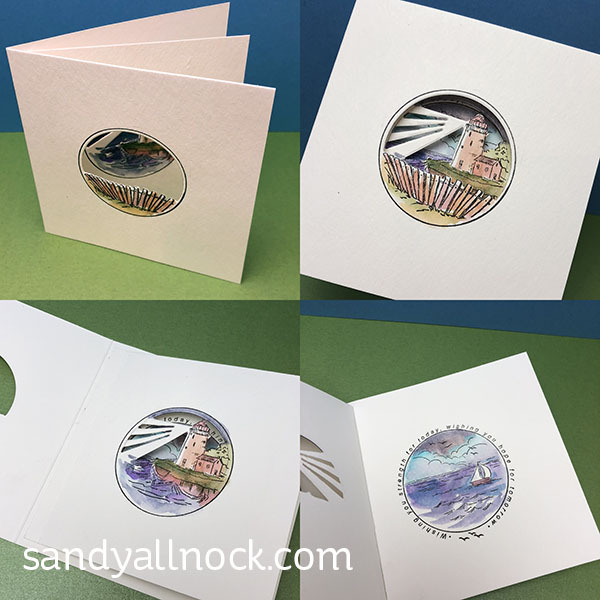 And the “booklet” style one too – the pic I saw had paper layers and was on a normal sized card. But instead, I did the “CAS” version of what I saw, all on Canson XL paper – which works better with markers like the Zig Twin Tip ones used here. Watch the video below or click HERE to see it in HD on YouTube. First, the “basic” format of a tryfold – shown in yesterday’s project. Next is a “booklet” style card, with an extra panel inside. 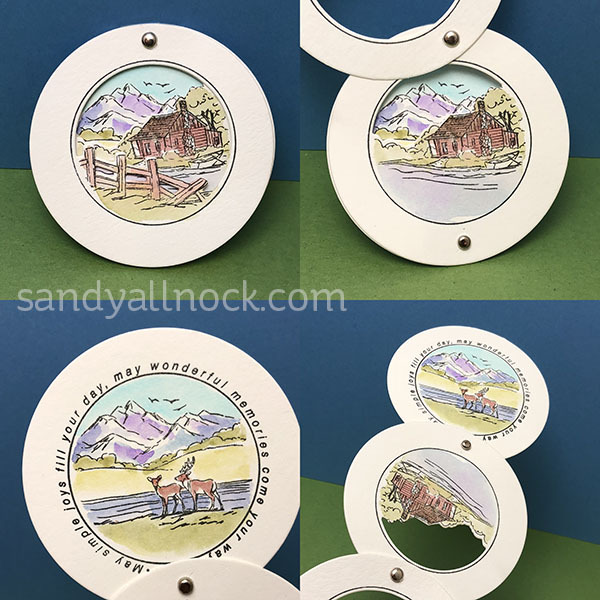 Here’s a birthday card that attaches at the top to open, using a brad. Note the round sentiment is missing on this one, but it’s on the stamp set – I masked and wiped it off. And last but not least, a chain-style round card that spins on two brads. I love these. Thanks for sharing. I probably wouldn’t have given them a second look if I hadn’t seen your video! OH MY GOSH, SANDY! Those circular cards are to die for. Those are AMAZING!!! You blow me away. You always are so inspiring and make me laugh – thank you always for your inspiration and the pick me ups you always provide. 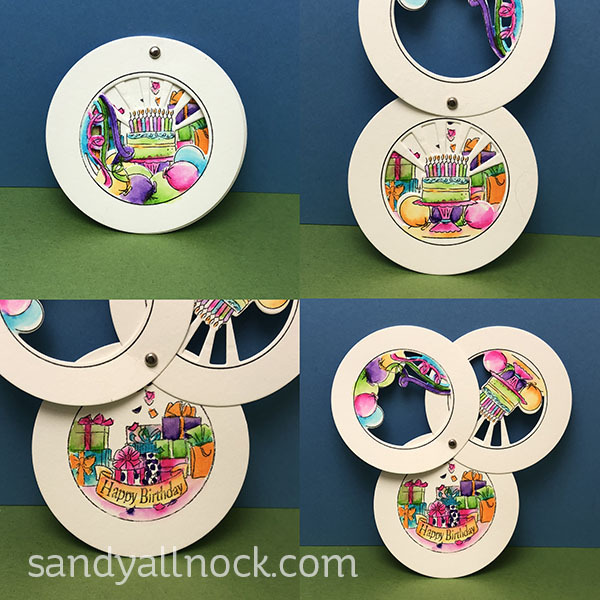 Awesome stamp sets and I love the way you showed us more ways to make gorgeous cards with them. Thank’s Sandy. Great carxs. I like the telescoping idea. These are awesome!! Thanks for sharing so many different ideas and options!